The geometry and snapshot files use the open source Visualization ToolKit (VTK) (http://www.vtk.org) format which can be viewed in many free readers, such as Paraview (http://www.paraview.org). Paraview is an open-source, multi-platform data analysis and visualization application. It is available for Linux, Mac OS X, and Windows. Fig. 5 Paraview toolbar showing gprMax_materials macro button. Open the file either from the File menu or toolbar. Click the Apply button in the Properties panel. You should see an outline of the volume of the geometry view. Install the gprMax_materials.py Python script, that comes with the gprMax source code (in the tools/Paraview macros directory), as a macro in Paraview. This script makes it quick and easy to view the different materials in a geometry file. To add the script as a macro in Paraview choose the file from the Macros->Add new macro menu. It will then appear as a shortcut button in the toolbar as shown in Fig. 5. You only need to do this once, the macro will be kept in Paraview for future use. Click the gprMax_materials shortcut button. All the materials in the model should appear in the Pipeline Browser as Threshold items as shown in Fig. 6. Fig. 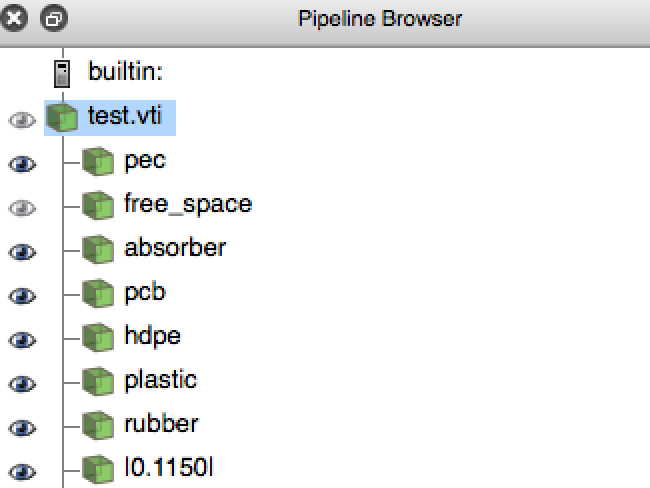 6 Paraview Pipeline Browser showing list of materials in an example model. You can turn on and off the visibility of materials using the eye icon in the Pipeline Browser. You can select multiple materials using the Shift key, and by shift-clicking the eye icon, turn the visibility of multiple materials on and off. You can set the Color and Opacity of materials from the Properties panel. The #snapshot: command produces an ImageData (.vti) snapshot file for each time instance requested. You can take advantage of Python scripting to easily create a series of snapshots. For example, to create 30 snapshots starting at time 0.1ns until 3ns in intervals of 0.1ns, use the following code snippet in your input file. Replace xs, ys, zs, xf, yf, zf, dx, dy, dz accordingly. Open the file either from the File menu or toolbar. Paraview should recognise the time series based on the file name and load in all the files. Click the Apply button in the Properties panel. You should see an outline of the snapshot volume. Use the Coloring drop down menu to select either E-field or H-field, and the further drop down menu to select either Magnitude, x, y or z component. From the Representation drop down menu select Surface. You can step through or play as an animation the time steps using the time controls in the toolbar. Turn on the Animation View (View->Animation View menu) to control the speed and start/stop points of the animation. Use the Color Map Editor to adjust the Color Scaling.